This sweet scene is such a reminder for me of all the reading we did with our kids. There was one book our daughter wanted read to her at least 10 x a day when she was small. It was called “Meet My Buddy”, but you know what, it all paid off, she was reading on her own without us really teaching her, before Kindergarten started, and now she is going to be a teacher after she graduates from University this spring. I love how reading transports you to other times, other places, with unique characters, and what a gift that is to our kids. I think this image is pretty precious, it's from ADFD and it’ s called Book Time. I love the mom’s messy bun and the cute pigtails on the daughter. Very fun to colour too. Printed onto XPress it Blending card stock, and then coloured with Copics in this fun colour palette that’s one of my favourites. I used some pretty polka-dotted paper, created stripes in the blanket they’re laying on, and then added some polka-dots onto the little girls shirt with a white gel pen. A bit of grossgrain ribbon, some tiny scallops and enamel dots complete it. Hope today is the perfect adventure for you! so precious, we did the same thing with our daughter and now she is getting her doctorate from Yale. Terrific coloring and papers! I can't say enough about the value of reading. My mom instilled that in me from an early age, and it does transport you to wherever and whenever the storyteller takes you. This is beautiful and serene, and I do love the color combo. So cute with the scallops under the sentiment flag. 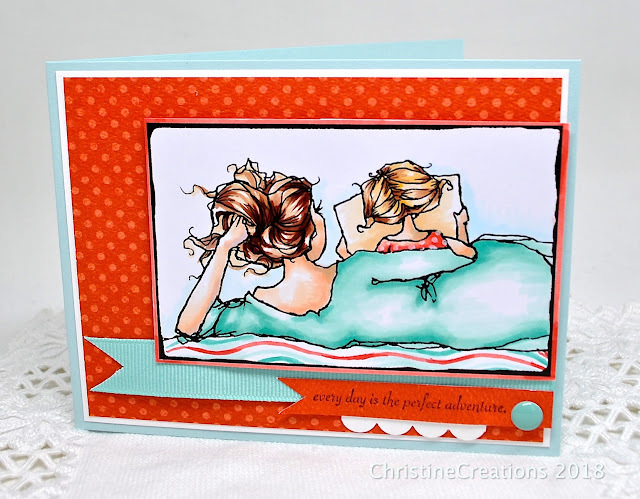 A very sweet card, Christine!